Brian Faulkner: A "Mercedes" Voice. "Your narrations are always right on." Brian Faulkner is known for his "Mercedes" ﻿﻿​delivery. even if the comparison is only half right! 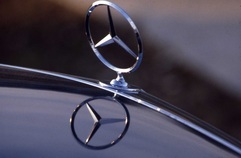 My "Mercedes" delivery is perfect for upscale brand and image spots, and my narration style is a great match for TV magazine program segments and documentaries about history, people, business and the arts. Corporate clients have said they like my voice because it is both believable and authoritative, that it showcases their message without showing itself off. And advertisers have said I sound "natural" -- not like an announcer. My voice also is versatile. I can provide a smooth, thoughtful take one minute and a cool, wry one the next - or transform myself into the dad next door, a wise old grandpa or a lighthearted storyteller. Please give a listen and decide for yourself whether my voice is a match for your project. Need a touch of humor? LOVED the laugh you threw in -- that was perfect." Below are samples of VO for web or television. I wrote and narrated a short promo for the Blowing Rock Art & History Museum and a 3-minute piece describing the town's many attractions for their web site. Both videos were shot and edited by Kyle Grove of Rock Ridge Productions, Boone, NC. Whalehead Club is a beautifully crafted eleven minute documentary about an art nouveau coastal mansion, the fascinating people who built it and the era that spawned it. This segment was one of more than 120 I have written and voiced for the Emmy-award winning Our State series on UNC-TV (North Carolina Public Television). DDB Unlimited's objective was to position itself to advantage on their web site, to grab and hold prospects' attention, sell product features and benefits and generate qualified sales leads. I wrote the script based on internet research and answers to questions submitted to the client by producer Kyle Grove of Rock Ridge Productions.